White On Baby Green Cheek? Hello! My feathered pets of a few years decided to have some babies. 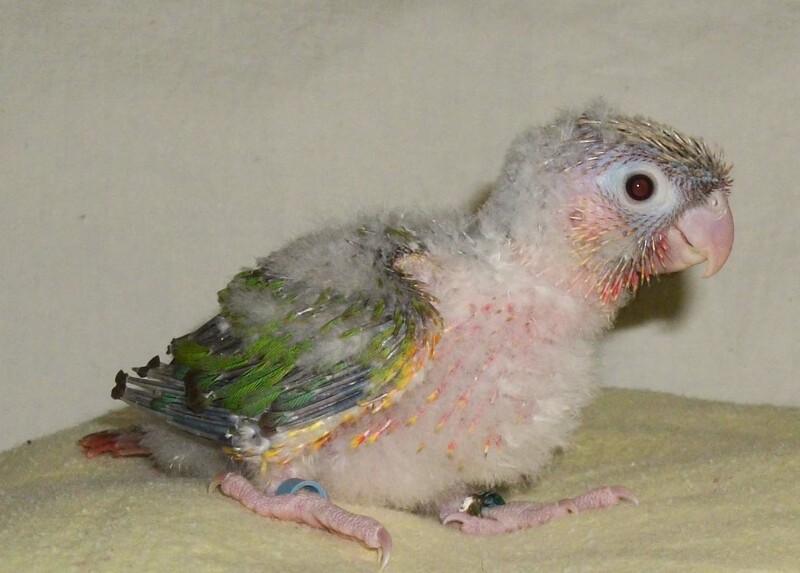 The male is a normal Green-cheeked Conure and the female is a yellow-sided. They currently have 3 babies, the eldest being 3 weeks, the second 2.5 weeks, and the youngest 2 weeks. All three of the babies appear to be developing features that define them as normals (Dark feet, dark beak, grey down), but it seems each of the chicks has some kind of white feature. The eldest baby has pure white down feathers of the front edge of its wings, instead of gray, and a white patch in a couple of its toes. The middle baby has white down on the base of its neck and wings. The youngest baby has a white toenail. The parents are being fed Zupreem pellets as the base, with daily fruits and vegetables. However, there is a couple things that I find odd. The male has an orange feather on each shoulder, and a small white patch on the underside of the front edge. The female also has some white on the underwing. Is there any explanation for the white on the chicks? Genetics? Vitamin Deficiency? Any help would be greatly appreciated. Thank you! Re: White On Baby Green Cheek? Last edited by Owlet; 04-07-2019 at 12:35 PM. The babies have dark features like a normal, but each chick has some kind of light feature. Although technically pineapples are possible with this cross it is very unlikely considering all pineapples would be females and I'm not sure if the father is a carrier for any sexlinked mutation. I still can't figure out how to upload pictures via my phone I'll try some more. Last edited by featherfanatic; 04-07-2019 at 01:12 PM. just shows up blank for me. did you try imgur? Ah dang it. I haven't yet. I will try now. 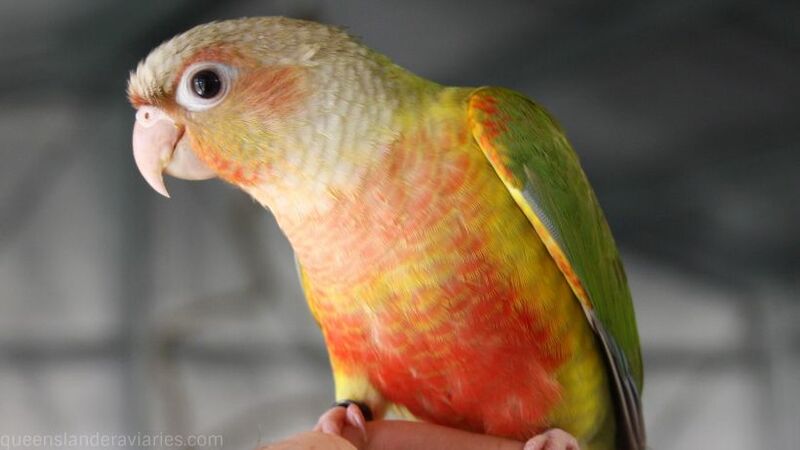 Edit: Also, after some online foraging, I found an article where a conure had a single misplaced orange feather on the shoulder (like my male) and a person commented that it was most likely the pied gene. This got me thinking, could the white feathers (if they even mean anything) be somehow related to my male's possible pied gene? I really have no idea what to expect. Last edited by featherfanatic; 04-07-2019 at 01:48 PM.